A Reprint: First published April 2006 in various outlets. I have just finished reading Professor Wole Soyinka’s new book, You Must Set Forth at Dawn. My first thought is that it is an important book for various reasons and I would encourage those with an interest in learning about the struggle for the heart and soul of Nigeria, albeit from Soyinka’s perspective, to go buy the book and read it. Soyinka has a lot to say in this book and I suspect that he is not finished yet despite this hefty tome (exactly 500 pages, if you count the Acknowledgments page). Age has not slowed The Man down one bit. You Must Set Forth at Dawn is a dizzying tour de force in many ways; Soyinka has led a very busy and charmed life. There is hardly any road he has not taken and his international passport must be an immigration officer’s nightmare. 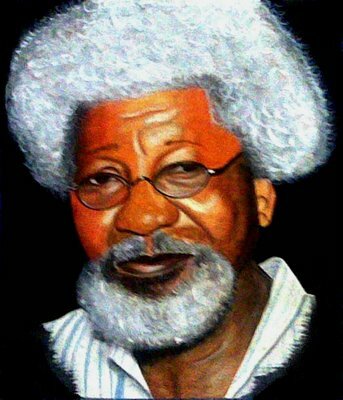 Soyinka is a renaissance man who comes across as extremely comfortable in the company of fine wines, fine women and generally the good life. Despite his travails and they are many, he has been treated well by an adoring world and deservedly so. And boy is he busy! Soyinka manages to situate himself in every major event in Nigeria’s troubled history. I mean, this man is everywhere. He was actually at Dodan Barracks the day Gideon Orkar’s coup rattled Nigeria; indeed he had met with Nigeria’s Dictator Du Jour, Ibrahim Babangida shortly before the coup started. For Soyinka, roads are everywhere and they open up for him and take him everywhere, sometimes to places he has no business being in the first place. The book is a celebration of Soyinka’s indomitable spirit. This was an intimidating display of his power of mental recall from the deep recesses of his memory. Age has not slowed Soyinka’s brain cells one bit. Either that or Kongi keeps a detailed journal every day of his life. He seems to remember verbatim whole conversations that happened decades ago. People would be interested in his re-telling of many escapades of his that have attained mythical status – the hijacking of Chief Samuel Ladoke Akintola’s speech in place of his at the radio station in Ibadan, his role as emissary in various seminal events in Nigeria, and I might add all over Africa. The book is a fascinating story told chapter after chapter. The language is not as dense as I am used to which is nice. Soyinka’s pen is getting gentler in the dusk of his life; one can actually be engaged in the book for the most part. I liked Soyinka’s inclusion of maps of Nigeria that were really time stamps of her changes over time beginning with the regions and then the genesis of the states. There is also a useful chronology of important dates in our nation’s history. He also narrates his escape from Sani Abacha through Nigeria’s borders and there is a chapter on Kenule Saro-Wiwa’s murder. My favorite chapter is By the Waters of Babylon, where he tells with the deft use of robust prose and powerful imagery his final escape from Abacha’s Gulag (through Nigeria’s border with Benin). His description of his friendship with the late Femi Johnson was genuinely moving, a poetic ode to the strong bonds of friendship. Those with an interest in Nigerian history should read this book. Those with an interest in the January 1966 coup and the ensuing civil war would be extremely interested in Soyinka’s narrative in the chapter titled Uncivil Wars: The Third Force and the Midwest Incursion (Strangely, Soyinka dispenses with the use of numbered chapters, making the book a challenge to follow as it wanders all over the roads, waterways and airways of the world). In summary Soyinka provides some important and new insights about his relationships with almost every key player (civilian and military) in the experience that has been Nigeria to date. For example, he reveals that after the death of Sani Abacha, the Abubakar Abdulsalami administration wanted him to run for President (yes, of Nigeria, not of a theatre company!). He wisely declined after thinking it over (Soyinka as President! That would have been something!). Unfortunately, from my perspective, there are whole chapters missing from Soyinka’s story. There are key players missing who do not feature even in Soyinka’s shadows as he tells his version of the struggle for Nigeria. They will have to write their own books. One key player missing in Soyinka’s book is the Internet. Too bad. Whatever were the strengths of the pro-democracy movement, the Internet amplified them with startling force. The Internet was a leveler; you did not need a boatload of money to “fight” the enemy. Suddenly one could create a one-man army and suddenly Nigeria’s conventional forces of evil found that they had no choice but to fight these new rag-tag armies of strong-willed individuals. And the term “Internet warriors” was born. Unfortunately, whatever were the weaknesses of the prodemocracy movement, the Internet also amplified with startling clarity. The prodemocracy movement did fritter away its energies in high decibel bickering while Nigeria burned. Meanwhile its numerous and frequent communiqués confidently proclaimed to the world the coming end of Abacha’s dictatorship. I used to half-joke that Sani Abacha would die of old age and the prodemocracy movement would claim credit for his demise. Regardless, the Internet does not get credit in Soyinka’s book for a lot of the work that went into fighting the dictatorship. A lot of people did not get credit for their contribution to any attempts to free Nigeria from her harvest of locusts. Rather Soyinka treats them as if they were mere props in a badly written play or if they were unlucky, hapless sidekicks in Soyinka’s restless quest for what seems to elude him each time he charges out on yet another journey of search and rescue. Chief Enahoro will not be amused at Soyinka’s unnecessary roughness but it is hilarious and when you stop laughing you go, this is one cat that doesn’t like a leash! My own analysis is this: Soyinka’s strength, Soyinka’s allure lies primarily in his stature as an international figure and in the eloquence of his powerful voice. He also has access to powerful people and places. All these attributes were precious money in the bank for the pro-democracy movement. But when it came to organization, even in his book, you come away dizzy wondering what all that drama was all about. Everything is long on high drama and poetic license but short on follow through. There was a lot of thunder but rain hardly came. Soyinka is brutal in his treatment of those who accepted assignments with military dictators but attempts rather unconvincingly and awkwardly to rationalize his controversial relationship with Ibrahim Babangida, arguably Nigeria’s most evil dictator; a man Soyinka once termed the listening president. Babangida gets a good, well-deserved dose of abuse from Soyinka’s pen but the uninitiated reader would not know the full extent of his relationship with Babangida. Similarly, the late Chief M.K.O. Abiola was no angel. However, Soyinka’s treatment of him in the book was basically a hagiography. It would have been useful to briefly explain the context in which Nigerians decided to support en masse this generous-hearted but flawed leader. His description of the disarray within the prodemocracy movement in the Diaspora is spot on. The pro-democracy movement did great things with whatever limited resources were at its disposal. But it was certainly an odd gathering of odd fellows who seemed to relish the fine art of bickering while Nigeria burned. The bickering was high decibel and largely unnecessary. Sadly Soyinka clutters his analysis when he resorts to personal attacks and ridicule against those who disagreed vehemently with him and the movement. A lot of people, some very young folks who incurred Soyinka’s wrath have now paid for it by having their names immortalized in unflattering ways in his book. Sadly, in at least one instance, in Soyinka’s re-telling of the incidents that earned his detractors his fiery wrath, some facts got lost in the translation. The personal attacks did not belong in Soyinka’s book. He should have stuck to issues and left these folks alone. The book could have used several edits by other people who were in the thick of things with Soyinka, people he rarely mentions in the book. In talking about the book with my friend Professor Bolaji Aluko, he vigorously disputed Soyinka’s version of many events that happened during the pro-democracy period, as well as much earlier in his father Professor Sam Aluko’s house on at least two occasions in Ibadan and Nsukka. Bolaji would know; he was there at the time. Indeed, Bolaji points out that Soyinka’s latest version of the stories have changed remarkably from the first narration in Soyinka’s Ibadan: The Penkelemesi Years. Bolaji intends to fully read the book and respond in his own memoirs. One thing is for sure, Soyinka’s new book is going to get him a lot of attention from his friends and detractors – which is probably his intention in the first instance. Yes, the book could have used a different set of critical eyes. For one thing, a book of this size and complexity should have been indexed. There are some errors that should have been caught. For example, he locates the making of the brew pito in Sapele (not true – every Nigerian worshipper of Bacchus should know that. He does footnote it correctly as beer made from millet. Millet and Sapele, an unpardonable contradiction in terms!). In his telling of it, gwon gwon, that delectable dish of the gods made of animal intestines becomes “ngwam-ngwam” and he footnotes it as “an Eastern Nigerian delicacy made from the chopped up head of a sheep or goat.” Our revered Soyinka was probably referring to isi-ewu. During the war, the name Gowon was turned into an acronym for “Go On With One Nigeria”; Soyinka remembers it as “Go On With One GoWon.” Finally, I cannot resist but comment on his awkward use of Pidgin English; it is cutely atrocious, as if written by a white man and it exposes Soyinka’s privileged upbringing. A pet peeve of mine: Soyinka faithfully footnotes every Nigerian word with detailed explanations but neglects to footnote his lavish use of French words and obscure English terminologies that tend to show off his erudition and worldly sophistication (those French wines!). I guess when it comes to Western culture the Nigerian reader has to do his research! Taken together, these errors as sloppy as they are are not fatal and they do not diminish the book. In my estimation, what diminishes the book, and Professor Soyinka, are the relentless personal attacks on those he happens to disagree with. And they are legion in the book. The tyranny of the pen is just as devastating as that of the gun. As Soyinka would probably say, it concedes power to no one but the owner of the pen; it assigns wrongs to everyone except the wielder of the pen. Also, Soyinka’s tendency to employ unflattering character sketches and caricatures on the unsuspecting (for example on Professor Sam Aluko) is unnecessary, rude, and mean-spirited. Most of these people are still alive and I suspect he will be hearing from them. Soyinka is a brave man. The legacy of our dysfunctional society has introduced a cultural pathology – a perverse culture of abuse which manifests itself in a debilitating inability to engage in civil discourse. That is a serious problem that needs to be fixed before we engage in any serious talk of nation-building. The book is an unsettling reminder of the complexity of the Nigerian problem, of constantly changing relationships among powerful brokers, relationships that are at once mutually parasitic and symbiotic, each one seeking the ultimate prize – power. It is a soupy, sweaty mess – of greedy, thieving, conniving self-serving agbada-clad politicians, academicians and soldiers, all aided and abetted by a populace long accustomed to the art of survival by apathy. And the beat goes on. I really do enjoy your reviews. I read this book about two years ago but your thorough review has brought memories. There were at times that I had to remind myself that I wasn’t reading fiction. Note, the copy published by Ayebia Clarke has an index. I appreciate your review turned Critique of Prof. You are right, I have read the book myself but still, professor Wole Soyinka, in my own analysis posseses the best Literary cerebrum in Africa and perhaps, the world. Not an intended exageration but the truth. Prof writes with passion and he is too versed. He knows the right world for every occasion and I apologise on his behall if there be any mistake made in the memoir. His works remains Archeological fossils of global literature. Sometimes you fool yourself in attempts to come out as an uber-discerning Bowdler, which only gives you away as a very uninformed. Here, I’ve read several reviews of yours where you lashed out at the pidgin English used by writers. My question: On whose authority is Nigerian pidgin standardized? You may need a lecture on lingustic variations to grasp varieties based on region, attitude, occasion, etc. Pidgin spoken in Warri can never be the same with the one spoken in say Kano, much as the Pidgin spoken by intellectuals can also never be the same with that spoken among Agberos. Please, mister, get some education. I must hunt and read this one. I like “Internet warriors.” Good news for Nigeria and the world as a whole that we have the Internet in our time to add to the arsenal for confronting the power of propaganda. Ikhide is unarguably Nigeria’s most gifted reviewer. He continues to chun out splendid reviews.